Who doesn’t love some John Carpenter? If you said you, you’re lying. Scream Factory is bringing us another trio of John Carpenter movies to the Blu-ray format. Someone’s Watching Me, Memoirs of an Invisible Man, and In the Mouth of Madness will be released to Blu-ray on July 24th courtesy of Scream Factory. Being one of Carpenter’s biggest fans, I cannot wait for this date. Of the three, In The Mouth Of Madness is the clear favorite, but a John Carpenter movie on Blu-ray is a coveted item, regardless of the movie itself. I’m not a huge fan of Someone’s Watching Me or Memoirs of an Invisible Man, but I will gladly revisit them for Carpenter. See below for the official press release. On July 24, Scream Factory will release three excellent films from the canon of John Carpenter (Halloween, The Thing) on Blu-ray, Memoirs of an Invisible Man, Someone’s Watching Me, and In The Mouth of Madness, the latter in a new Collector’s Edition. 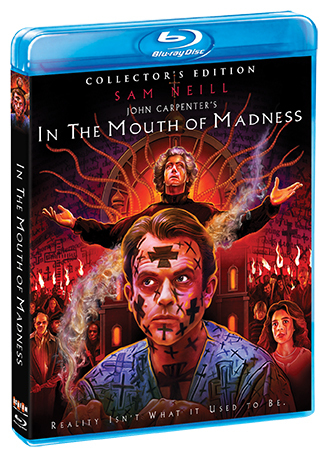 In The Mouth Of Madness [Collector’s Edition] boasts several exciting new special features, including a new audio commentary with director John Carpenter and producer Sandy King Carpenter, discussing the 1995 film. Inspired by the tales of H.P. Lovecraft, this shocking story is, in the words of its acclaimed director, “horror beyond description!” Sutter Cane (Jürgen Prochnow, Dune, The Seventh Sign) is the best-selling author whose newest novel is literally driving readers insane. When he inexplicably vanishes, his publisher (Charlton Heston, Soylent Green, Planet Of The Apes) sends special investigator John Trent (Sam Neill, Daybreakers, Dead Calm) to track him down. Drawn to a town that exists only in Cane’s books, Trent crosses the barrier between fact and fiction and enters a terrifying world from which there is no escape. 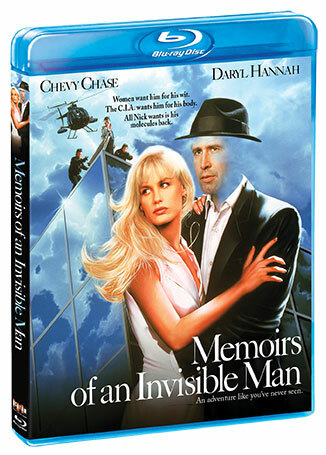 Chevy Chase takes center stage in 1992’s Memoirs of an Invisible Man. Thanks to a nuclear accident, Nick Halloway (Chase) has become invisible. Invisibility makes it easier to spy on agents (particularly chief adversary Sam Neill) who’ve put him in his predicament. And he can romance a lovely documentary producer (Daryl Hannah) in a way she’s never “seen” before. John Carpenter directs and Industrial Light and Magic create eye-opening effects as Nick embarks on his manic quest. In 1978’s Someone’s Watching Me, Los Angeles newcomer Leigh Michaels moves into a chic high-rise apartment building. She loves the view. So does the Peeping Tom who lives somewhere in the adjacent tower. John Carpenter writes and directs this thriller where the breath-catching suspense starts at the moment Leigh (Lauren Hutton, American Gigolo) is framed in the lens of a telescope. For Leigh, it’s the beginning of terrors that escalate from anonymous calls and gifts to lights that mysteriously flicker to prove that someone watches every moment of her life. Leigh fights back, matching her tormentor’s obsession with her own relentless drive to uncover his identity. The prey is now predator – and that escalates the stalker’s game to a deadly new level. Someone is watching.